Georges Vanier Elementary is a wireless campus…an increasing number of students are bringing their wireless devices to school…any staff members have a keen interest in technology and how it can be effectively integrated into teaching and student learning…all the ingredients of a “perfect storm”. BYOD – bring your own device – may have seemed a thing of the future, but after my experience a few days ago, I realize that the time for BYOD might be now! While on supervision a few days ago, I had a conversation with a group of girls from several of our grade 5/6 classes. I noticed one of the girls with an iPod touch in her hand. I asked her if she used her iPod in class and it was clear that she thought she was in trouble for having the device at school. 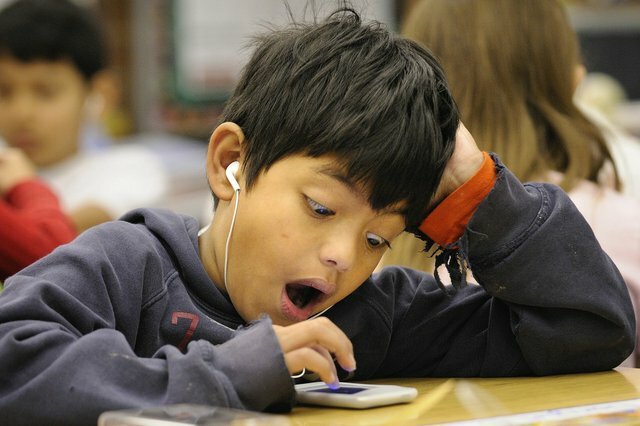 Once she realized that I was genuinely interested in how the iPod could be used in class to enhance learning, the student began to share that her teacher did in fact know about the iPod and that she was permitted to listen to music during art or when class assignments had been completed. I continued to probe. Had she used her iPod as a calculator? Had she looked up the definition of word she didn’t know? Had she gone online to answer one of the many nagging questions that spontaneously pop up everyday in the classroom? All of these activities would have been easy to do in a wireless environment, but she hadn’t yet made the leap. Then I discovered that 6 of the 8 girls in the group I was speaking with had iPod touches. They all began to pull them out (now that they knew I wasn’t going to confiscate them :-). What did I learn? Well, besides the interesting fact that girls like to carry their iPod touches on the inside of their boots, I learned that we may be closer to BYOD than I would have thought – close enough that it may be time to start conversations with teachers and parents regarding how they feel about opening the parameters and allowing students to openly use their own wireless devices. Students are armed and ready. Are we? Thank you for the post Antonio! This is something that I have been wondering about too. I just didn’t term it BYOD. I believe in the next 5 years we will see every school in our district wireless and every kid who has a device will have it with them at school. A number of policy questions I am sure are being considered around this. One I am curious about is at what age should we entrust students to start bringing the devices to school? I am sure there is a very real worry about them being lost at school. Our classroom model as we know it is changing!! We borrowed the district iPods a few weeks ago. Since we did that, we see the students with iPods a lot! They have them out, want to use them and we are not quite sure what to do. We are not a wireless campus, so they would not be able to use them to their fullest potential here at all, but it is quite amazing how many of them are ready and willing. One of our grade 7 classes is going to have a “tech” day where they can bring in their devices and play music while they work and use the apps on their devices. They are quite excited about this. They ARE ready and able! Now when are we going to be *ready*?